Listen to aviation historian and author Ian Castle's appearance on Dan Snow's History Hit podcast: The First Blitz with Ian Castle. Click here to download the episode via Acast. 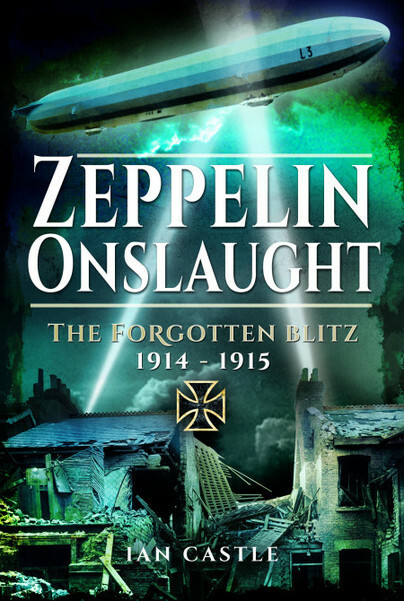 You'll be £25.00 closer to your next £10.00 credit when you purchase Zeppelin Onslaught. What's this? Order within the next 2 hours, 45 minutes to get your order processed the next working day! At the outbreak of the First World War, the United Kingdom had no aerial defence capability worthy of the name. When the war began Britain had just thirty guns to defend the entire country, with all but five of these considered ‘of dubious value’. So when raiding German aircraft finally appeared over Britain the response was negligible and totally ineffective. Of Britain’s fledgling air forces, the Royal Flying Corps had accompanied the British Expeditionary Force into Europe leaving the Royal Naval Air Service to defend the country as best it could. That task was not an easy one. Airships only appeared at night and for British pilots night-flying was in its infancy. From the first raid in December 1914, aerial attacks gradually increased through 1915, culminating in highly damaging assaults on London in September and October. London, however, was not the only recipient of German bombs, with counties from Northumberland to Kent also experiencing the indiscriminate death and destruction found in this new theatre of war – the Home Front. The British population was initially left exposed and largely undefended when the previously unimagined horror of bombs falling from the sky began, killing children in their beds and destroying homes. The face of war had changed forever. Those raids on London in the autumn of 1915 finally forced the government to pursue a more effective defence against air attack. The German air campaign against the United Kingdom was the first sustained strategic aerial bombing campaign in history. Yet it has become the forgotten Blitz. Those first bombing raids in 1915 claimed over 700 casualties. Relying heavily on first-hand accounts, Ian Castle tells their story, along with that of the raiders, and those who fought desperately to stop them in the opening year of Britain’s forgotten Blitz. The author has produced a much-needed chronicle of a largely underrepresented aspect of the First World War. The book's strength is in crafting fine researched daily events and accounts from opposing sides, both in the air and on the ground, into a cohesive narrative of the new technological dawn that would shape how all later military conflicts would be fought. Author Castle provides a fascinating account of these strikes and the belated British efforts to counter them. It is well told and illustrated with two eight-page sections of black and white photographs. A recognition of human tragedies long overdue. It is impossible in a short review to cover adequately all the aspects of the campaign detailed in this superb and important book which I can only recommend without reservation. I am aware of a blue plaque on a building somewhere in the town where I live proclaiming that this was the site of the first Zeppelin bomb drop during the first world war. I don't know if the claim is genuine, but Ian's book is a well-researched and readable account mainly of the first blitz, and the daage inflicted by zeppelin raids throughout Britain in 1914-1915. Superb historical treatise. Due to the level and depth of its research... this volume could potentially become an authority on its subject. It is well written and is likely to appeal to Military and Social Historians. Aviation Historians with an interest in German airship operations during World War I are also likely to find it of interest, as are readers with an interest in the home-based operations of the Royal Air Force and Royal Naval Air Service during that conflict. Readers with a more general interest in early aviation may find the limited number of aviation-related photographs of interest. Aeromodellers might also find them useful. With high production standards and sections of photos on glossy paper it's a gripping guide. It considers the air raids against Britain in 1915 in a level of detail not seen in previous works, offering the reader an in-depth examination of not only the Zeppelins themselves but also of Britain's fledgling aerial defence system, which at the outbreak of the war was virtually non-existent.